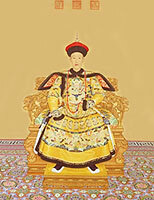 Emperor Qianlong ruled for 60 years (1736–1795), during China’s last imperial dynasty, the Qing dynasty. His reign was longer than any other emperor in Chinese history apart from his grandfather, Kangxi. The emperor is best known to art historians as a collector who amassed the largest collection of art known up to that point in China. His passion for collecting extended to paintings, porcelain, bronzes, jades, writing implements, and rare books. Qianlong is credited with pacifying the warring territories of western China, fostering innovation in the arts, and commissioning a comprehensive edition of all existing Chinese literature. Splendors of China's Forbidden City offers a dramatic examination of the reign of the Emperor, featuring over 400 artifacts from this prolific period the majority of which have never left the Forbidden City Palace Museum in Beijing.